A sinister unidentified flying object plummeting to Earth changes our view of humanity and life beyond our planet in the thrilling new sci-fi spectacular ATTRACTION. The film will be available across all digital platforms beginning December 2018 along with a Blu-ray and DVD release. 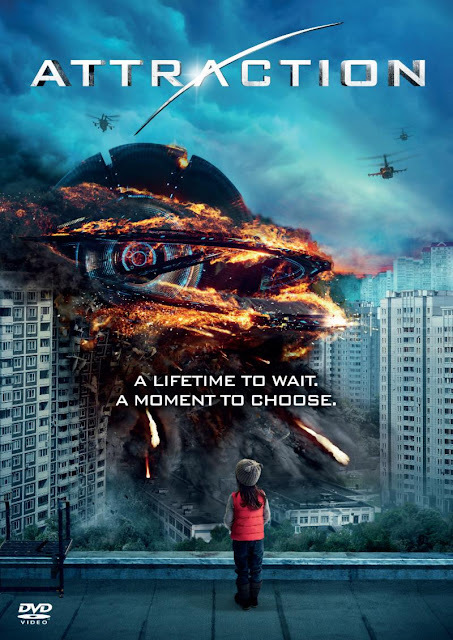 ATTRACTION is a big sci-fi action spectacle with state-of-the-art effects and production design, a film that stands alongside such blockbuster favourites as Independence Day, Pacific Rim and District 9. It is the latest film from renowned Russian filmmaker and actor Fedor Bondarchuk (Stalingrad, Dark Planet). He is currently filming a sequel for release in 2019. Rich Cross of Starburst called ATTRACTION "a bold and sophisticated tale ...a landmark entry in the modern Russian sci-fi film canon." "Whenever the mothership starts whirring, or its mutant metallic spawn work their warlike mischief, it's quite a lot of fun," said Nigel Andrews of the Financial Times. Moscow finds itself on the brink of destruction after a mysterious spaceship crash-lands in the center of the city. While the government seeks to find out what the ship's passengers want and how to protect the local population, the rest of the city residents break into conflicting factions. Some view the aliens as a threat that should be extinguished, while others hope that the visitors are peaceful and offer an opportunity to learn more about the world beyond. ATTRACTION will be available across all digital platforms, Blu-ray and DVD from 4th December 2018. Labels: Action, Alien, Aliens, Attraction, Dark Sky Films, Fedor Bondarchuk, Sci-Fi, Science Fiction, U.F.O.